Blue Star Direct have acquired a one year Mailhouse and Card Services contract for Essendon Football Club. Founded in 1873 Essendon FC, or the ‘Bombers’ have a loyal member base of over 50,000 fans. Blue Star Direct will play a vital role in communicating to the member base, contracted to work on member communication including pre-renewals and renewals, membership cards, birthday cards, the membership magazine, digital print and ad hoc campaigns. During the contract acquisition process, Blue Star Direct worked closely with the Essendon membership team to understand the end-to-end membership process and experience. Rachel Baldovino, General Manager Sales & Delivery VIC says “we’re very much looking forward to developing the working relationship we’ve established with the Essendon team. By continuing to work closely with them, we’re confident that we’ll see great innovations in membership communication in the year ahead”. The Club has over 90 staff led by Chairman David Evans and Chief Executive Officer Ian Robson. 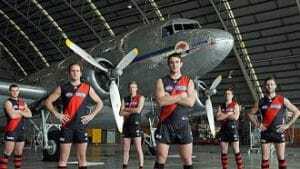 Currently located in Windy Hill in Napier Street, Essendon will move to the Club’s new High Performance Centre near Melbourne Airport, expected midway through 2013. It’s a time of development for the Club and Blue Star Direct are proud to be part of this journey.